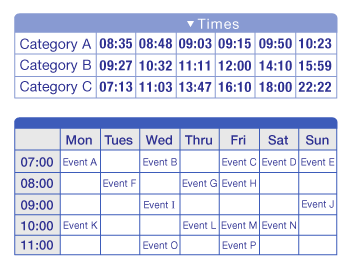 Timetables are used as a referencing and management tool for scheduled events, tasks and actions to take place. Organising the data with a table into chronological and/or alphabetical order helps users for quicker referencing. Timetables are commonly used to display the arrival and departure time of trains and other forms of transportation.